Lorenzo Staelens had a great career that began at the White Star Lauwe in 1982. After two years at KV Kortrijk Lorre moved to FC Bruges, where he showed his talent. He played 369 games and scored 105 goals in nine seasons with the Blauw Zwart and is in an exceptional record: 4 titles, 3 and 6 cups of Belgium Supercups. Then, Lorenzo Staelens joined the main rivals of Bruges, RSC Anderlecht in 1998. Just arrived, he won a fifth title and finally the Golden Boot. In three seasons with the Purple, he played 87 matches and score 11 goals. In 2001 he left Europe and will finish his career in Japan in a second division club, Oita Trinita. 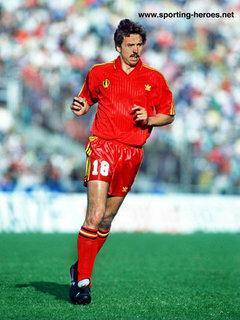 He was Belgian international from 1990 to 2000. He played 69 games with the Red Devils and scored 7 goals. He played the 1994 World Cup and World Cup 1998. After a short break, he returned to head the Futurosport the Excelsior Mouscron then as head coach of the club. His results are considered insufficient and returns handle the training center. The following season, he left the club for the Eendracht Aalst as head coach. Two months after his arrival, he decided to leave the club following problems with the president. He lead the Blue Star K Poperinge in provincial championship in 2004-2005. He was then sporting director of KV Kortrijk 2005-2006. A year later, he was assistant coach at KSV Roeselare before joining Cercle Brugge KSV in July 2008 to help coach Glen De Boeck.